A brand new Arena Challenge has begun! In an ARENA CHALLENGE, you begin with a team of gods already on the map which you must use to defend against waves of enemies. Buildings inside the Arena belong to your team. You’re not required to protect them, but they can enhance your defense if you choose to use them! Decorations are also invincible, but Temples and Houses outside the Arena may optionally be destroyed by ranged gods to reduce the range and/or damage of the enemy Towers. You must defeat ALL enemy troops and survive with at least one god left standing to be victorious! 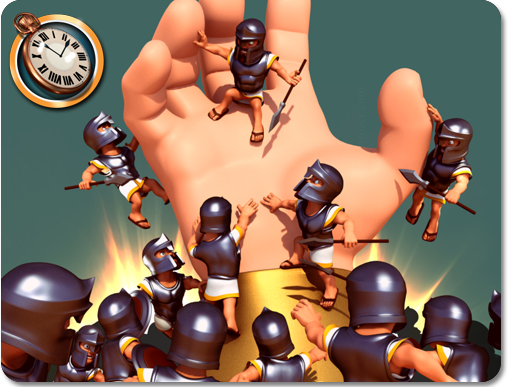 As with all Challenges, every player is given an identical set of gods for each Round, so you can compete with other players of all levels and fight your way onto the Leaderboard to earn gem prizes!